Located in the heart of the main library of CSUEB, it is being designed as a “book you can walk through.” By offering an overview of world history as a whole, students will have an integrated visual context for all their studies, and an ongoing opportunity to perceive unexpected relationships. Having seen the “global village” as an interconnected whole, they will be better prepared to be global citizens in the 21st century. Most museums are devoted to art, or science, or history. This will be all three. 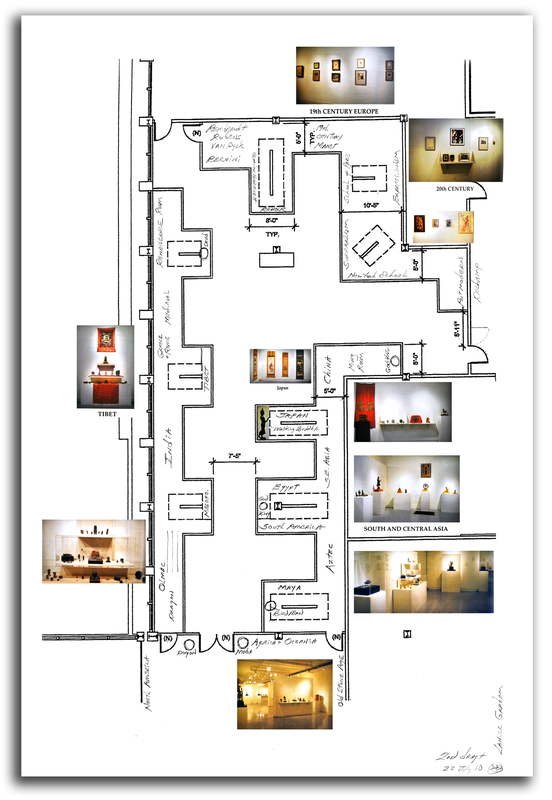 Most university “teaching museums” have a narrow focus on selected areas. This Center will not. It will be the first “teaching museum” of its kind because of its comprehensive character. Thanks to the recent donation to the university of several hundred works of art, the visual art of all major cultural regions and traditions from the Stone Age to the present will provide the conceptual structure of the general experience. The exhibition technique being developed for this project is called “Planimetric Perception.” The primary plane-of-perception is large and very vertical. Fine art will be located on this tall plane-of-perception, on the back walls of the glass enclosures. Art Museums often do little more than that. They hang the art and stop, often insisting no other effort is required because “the art can speak for itself.” This is an elitist position and part of the reason visitors to art museums are often limited to the middle and upper middle classes. People not educated in art appreciation or art history are left behind, and that includes most students at public universities. Most lower division students at CSUEB, for example, have never been to an art museum. Perceptual bridges must be constructed. “Planimetric Perception” is a bridge-building technique. At the very front of the display spaces will be the 3rd plane – a small, thin, horizontal plane-of-perception that frames and introduces the two levels of display behind it. Many museums have found it most useful to place in this position most of the textual information in such horizontal strips. The more “educational” museums have added photographs to these strips. Graduate interns in the Museum Studies program of CSUEB have gone farther. Their research has determined that visitors are even more engaged in the process of information-absorption if these strips contain miniature, 3-dimensional objects that “picture” aspects of history, e.g., furniture, fashions, weapons, cars, planes, and telescopes. These interns are exploring how small objects and graphics from the history of astronomy, geology, biology, sociology, warfare, transportation, the decorative arts, etc., can provide a 3-dimensional chronology first of cosmic history and then of human history. In this Learning Center the word “world” is being used in the widest sense. The reference is to the universe as a whole. The plan calls for Introductory Galleries to contain a series of display panels that trace the development of the universe from the Big Bang. This series on the “Story of the Cosmos” will progress through Cosmology, Astronomy, Geography, Chemistry, Biology, and Physical Anthropology. Each panel will explain the basic elements of each discipline and how that discipline contributes to our understanding of the development of humanity. Embedded in each wall panel will be an iPad that will offer Internet access to more aspects of each subject area. After this general introduction to the history of natural sciences, the later galleries of human history begin. Here the “Story of Humanity” will be told in a chronological manner, from the Stone Age and the Bronze Age to the present. Information and insights will be used from the disciplines of Art History, Cultural History, the Social Sciences, Languages, Literature, World Religions, and Philosophy. The Deans of all four colleges of CSUEB have indicated their enthusiastic support for this unique educational resource. The faculty of all the Departments at CSUEB and other universities will be consulted on the material displayed and the educational labels that contextualize the artifacts. The University of California, Berkeley, and Stanford University have been part of the planning process from the beginning. Most chronologies and identification labels in museums are simply small, flat panels placed on one wall. Studies have shown that most visitors spent about 15 seconds reading such texts. The chronology and label-set being developed for the World History Learning Center is an engaging “river” of tactile objects, from moon rocks to campaign buttons, running throughout the Center. Many of these objects will be from the daily life of the various eras, and thus provide not only historical context for the larger objects, but also function psychologically as pathways for students to think their way from the “ordinary reality” they see every day to the “extraordinary reality” of outstanding works-of-art, works that give vivid expression to the highest hopes and deepest dreams of every cultural tradition.